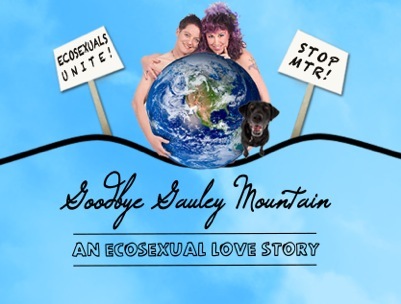 Goodbye Gauley Mountain: An Ecosexual Love Story by Beth Stephens with Annie Sprinkle recently won the Santa Cruz Film Festival's "Spirit of Action Prize." The Spirit of Action Prize is SCFF's signature award to recognize films that highlight challenges in our society and identify solutions. Awards are chosen by audience feedback scores. The SCFF board president, Elizabeth Gummere said, I think your film REALLY encompassed what we were going for when we invented this award several years ago. Taking a bleak environmental disaster and creating a joyful - and universal - call to action is about as Spirit of Action as it gets."